"Artists create from a place of vulnerability, sometimes going against the grain. Ellyzabeth Adler is a multidisciplinary artist who weaves together theatre, dance, film and music to engage and inspire audience in the genre of "tanztheatre." She founded Chicago Danztheatre Ensemble, in 2001, dedicated to creating performances and partnerships that bring about change in the world around us through our performance ensemble and outreach programs. Ellyzabeth’s first love has always been ballet and her ultimate focus on becoming an interdisciplinary artist grew out of her childhood curiosity for the arts. She received the majority of her training at ‘The William Reilly Academy of Ballet’ from Mr. Reilly and Sheila Reilly . At 15, she started performing in the Milwaukee area some of her performance highlights of this time include the city’s first celebration of Dr. Martin Luther King Jr.’s birthday at the Performing Arts Center (PAC). 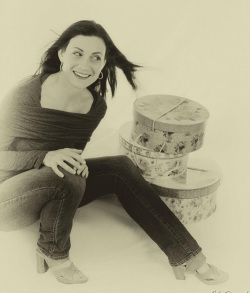 From 1994 -1997, Ellyzabeth attended Roosevelt University in Chicago on a full academic scholarship, where she earned a BFA in Performing Arts and a minor in Broadcast Journalism. At Roosevelt, she studied poetry, acting, physical theatre, costume design, dance and voice as well as a specially arranged year-long course study of Script Analysis of Shakespeare’s plays with department head, Yolanda Lyon Miller. She continued her academic education on a full scholarship at the University of Illinois at Chicago, 1997-2000, earning a Masters of Arts in Directing and Movement. At UIC, she was inspired studying danztheatre artists and theorists Rudolph Laban, Pina Bausch and Martha Clark and physical theatre director, Ann Bogart (SITI Company.) Through this inspiration, she found an art form to combine her love of the arts into original performance work that could engage audiences on a multi-sensory level. Her performing arts degree led her to dedicated to creating performances and partnerships that bring about change in the world around us through our performance ensemble and outreach programs. To date, Ellyzabeth has collaboratively adapted, directed and choreographed 8 full-length works: T.S Eliot’s Death Dream Kingdom, The Wasteland, Ever your own, Edgar, The Yellow Wallpaper, Chicago Stories, This Is Not A Pipe, and two one-act plays based on the poetry of Rumi, Touch and Mirrors. She has also created over a dozen concert-length works around women’s issues, the body, suicide, pathways to enlightenment and the human condition. In 2008, she was commissioned by the United Congress of Community and Religious Organizations - working with international painter Florent Mouttii - to create a performance based on his images of immigrants to France in response to the country’s race riots. The piece was performed at their annual conference.